Ken Gibson. His name came into my consciousness a good twenty years after I'd grown to know him as "Vincent Hedges". To me he was always Vincent, that funny vampire character on the Acri Creature Feature. There was something about him that was endearing -- his jovial attitude and enthusiasm were contagious. Many young kids and older kids-at-heart embraced the amiable Vincent Hedges. But who was Ken Gibson? I'd heard tales of a left-handed bowling champ. I wanted to say thank you to this man who had shaped such a significant part of my childhood -- the part that imagines, dreams and invents. Kenneth Harry Gibson was born on October 23rd, 1932 in Clinton, Iowa. After high school in Clinton, Ken attended college in Bismark, North Dakota and at Scott Community College where he received an Associate Degree in Nursing Home Administration. The Korean War called and he served as a private in the Army. Ken returned to the Quad Cities area and lived in Davenport and Williamsburg, Iowa and Carbon Cliff, and Kewanee, Illinois. In 1961, Ken was the Iowa State All Events Bowling Champion. He was a member of the 700 Bowling Club of America. Ken was a health care administrator for many years at the Williamsburg Care Center. He also was actively involved at the VA Medical Center in Iowa City as a volunteer. Ken was Quarter Master of the Iburg Poulson VFW Post #8797 in Williamsburg for 11 years and a member of St. Mary's Catholic Church in Williamsburg. 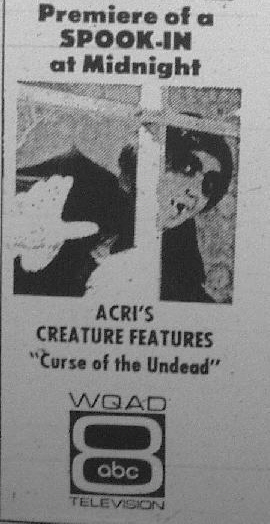 Around the age of 38 in October, 1970, Ken became the horror host of Acri's Creature Features. Spooky old movies and Vincent Hedges' silliness would entertain and inspire a massive audience of young and old alike. Vincent, joined by other characters like Emmett the hunchback and Beauregard the werewolf, brought joy and jolts of fun to everyone. The cast of characters from the show also did live fund raisers and charity events. It was the charity work that seemed to mean the most to Ken and something he worked at most diligently. 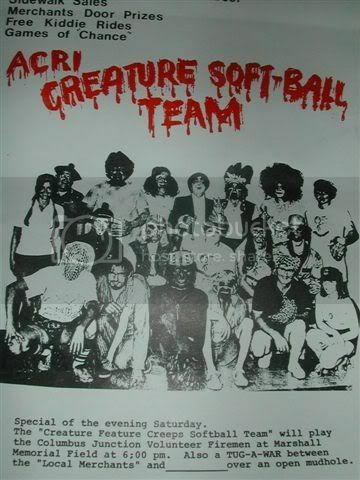 After the Acri work he helped to create an organization called Creeps for Charity. As time crept by, as it inevitably will, Ken found himself at the VA Medical Center as a patient. After a short illness he passed away on September 28th, 2006. He was 73, just shy of his 74th birthday. "My name Is Phil Mitro. My father-in-law is Ken Gibson, a.k.a., Vincent Hedges. [He passed] away this morning at 12:40am, September 28, 2006, at the VA center in Iowa City. He could not believe how much you kept Acri Creation Feature alive, and, Vincent Hedges. I wanted to let you know before it hit the paper because you kept him alive through your web page. TV was much different back in the early 70s, relatively new, so he brought laughter in the world, or just our part of the world. So please let Phil from Dubuque and Steven Jones know. I just recently found your web page and have been following it for the last few months. I did show this to Ken and he couldn’t believe the following your web page had. So thank you from the Gibson Family for keeping the greatest Creep alive in print and in your heart. And [thanks to] Phil from Dubuque and Steven Jones and the rest of the creeps who sign your web guest book. So for right now I will let you go and again want to thank you from our hearts and help us remember Vincent Hedges and the man who played him, Ken Gibson." I was saddened, but grateful that my thank you had at least reached him in the form of this website. I was glad that he witnessed and was impressed by the thank you that we all gave him. Quad-City Times - you can sign or read the guestbook. Thanks, Bob, for pointing this out. Powell Funeral Homes - with nice color photo. Obituary, column two. - Thanks, Phil. Ken will be remembered for his enthusiasm and energy. He loved music, bowling, having fun, being a ham and he loved people. What's more? One of our friends remembered Ken as Vincent riding a bicycle through a store. I remember this gentle vampire always giving the peace sign. Do you have a memory you'd like to share? Our guestbook awaits your entry.